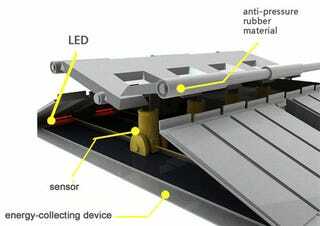 Speed bumps will never cease to annoy, but a new concept design makes them more palatable by adding shock absorption, energy regeneration and a string of LED’s. Carrying the flirtatious name of Safe Hump, it’s an elegant chain reaction: shock absorbers ease your vehicle’s passage over the bump while simultaneously generating energy to power the LED’s which light up at night, warning both motorists and cyclists. No word yet on where the unobtainium required to make this last for more than a day under two-ton SUV’s will be mined.